At least 59 people, not including the shooter, were killed and 527 injured in a mass shooting at a country music festival at the Mandalay Bay hotel in Las Vegas. LAS VEGAS (WLS) -- At least 59 people, not including the shooter, were killed and 527 injured in a mass shooting at the Route 91 country music festival at the Mandalay Bay hotel in Las Vegas. The shooting is the deadliest mass shooting in modern U.S. history. 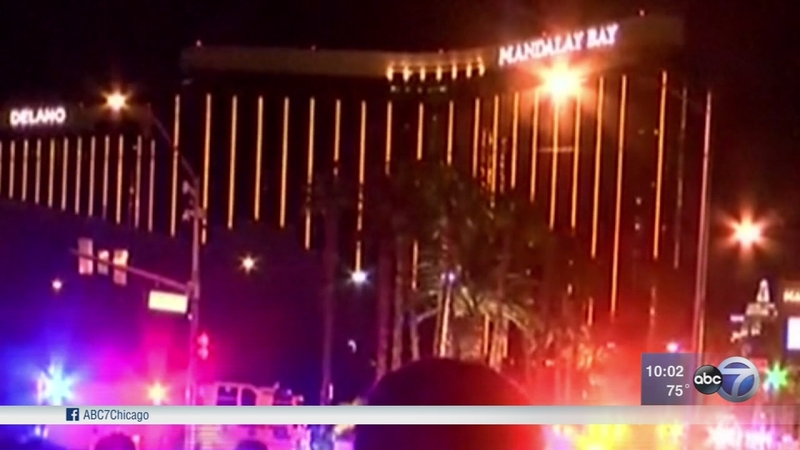 Authorities have identified the shooter as 64-year-old Stephen Paddock of Mesquite, Nevada. Officials do not believe he is connected with terrorism groups. Panic and chaos took hold the moment concertgoers realized the pops they heard were not fireworks. Clark County Sheriff Joseph Lombardo said Paddock was on the 32nd floor of the Mandalay Bay Hotel and Casino across the street from the concert. Police said Paddock likely killed himself before police made entry into his room. Paddock had been in Las Vegas since Thursday and housekeepers had been in and out of the room. Las Vegas Sheriff Joe Lombardo said 23 guns were found inside the room, including rifles and handguns. Authorities exercised a search warrant for the suspect's home in a retirement community in Mesquite. Police found 19 additional guns, several explosives and thousands of rounds of ammunition. Sheriff Lombardo said they also found several pounds of ammonium nitrate - a fertilizer that can be turned into explosives like those used in the 1995 Oklahoma bombing - in his car. Guns & Guitars, Inc. in Mesquite, confirmed to ABC News that Paddock was a customer but said they didn't know if the weapons he bought from them were the ones he used in the massacre. They sell semi-automatic weapons but not fully automatics. "Mr. Paddock was a customer and purchased firearms from our store; however, all necessary background checks and procedures were followed, as required by local, state, and federal law," a statement from Guns & Guitars said. "He never gave any indication or reason to believe he was unstable or unfit at any time. We are currently cooperating with the ongoing investigation." The suspect's brother, Eric Paddock, told ABC News that he was "dumbstruck" and that Stephen has no secrets in his past. Eric Paddock offered condolences to the victims of the shooting. Authorities said Stephen Paddock had no criminal record. Colonel Rob Manning, Pentagon spokesman, told reporters that Stephen Paddock did not serve in the military either. The Defense Department and the military services had all checked their records for possible military service in the wake of the shooting. "Steve had nothing to do with any political organizations, religious organizations," Eric Paddock said. "He played multi-$100-a-hand video poker." Paddock's niece Nicole Paddock posted to social media after the shooting, "Stephen Paddock was my uncle...it has been over a year since I had any contact with him. He never came across as religious or political. I am as shocked and appalled as anyone about this senseless act of violence." Stephen Paddock liked casinos. Six years ago he sued a Las Vegas casino after he slipped and fell. Video shows him later rubbing his leg, and an arbitrator found in favor of the casino. Paddock recently sent hundreds of thousands of dollars to the Philippines, and lived with his girlfriend, 62-year-old Marilou Danley, in Mesquite. Police were initially looking for Danley but later said they located her outside the country and do not believe she was involved in the shooting. Paddock had Danley's ID, police said. At a Monday evening press conference Sheriff Lombardo reasserted that police believe Paddock acted alone, and police have no evidence there was more than one assailant. The sheriff said a check of federal and state databases showed Paddock was not on law enforcement authorities' radar before the bloodbath. There was no word on a motive for the attack. Aaron Rouse, the FBI agent in charge in Las Vegas, said investigators saw no immediate evidence connecting it to an international terror organization, despite a claim of responsibility from the Islamic State group. The U.S. Homeland Security Department said there was no "specific credible threat" involving other public venues in the U.S.
Country music star Jason Aldean was performing Sunday night at the end of the three-day Route 91 Harvest Festival when the gunman opened fire across the street from inside the Mandalay Bay Hotel and Casino. SWAT teams quickly descended on the concert and the casino, and officers used explosives to get into the hotel room where the suspect was inside, authorities said. The guitarist for the Josh Abbott Band, who performed at the Route 91 festival Sunday night before Aldean, posted a strong statement on Twitter reversing his stance on gun control. "I've been a proponent of the 2nd Amendment my whole life," Caleb Keeter writes. "Until last night. I can't express how wrong I was...we need gun control RIGHT. NOW." Sheriff Lombardo said people outside of the Las Vegas area who are trying to locate family members should call 1-800-536-9488. A registered nurse from Tennessee who died shielding his wife, a doctor, from gunfire. The only son of a Canadian couple who is now left childless. A California middle school special education teacher engaged to be married. All were among the at least 59 people killed in the mass shooting at a country music festival in Las Vegas. Families, friends, coworkers and neighbors shared stories Monday about some of those slain and the hundreds more who were injured after a gunman opened fire on festivalgoers. Off-duty Las Vegas police officer and youth football coach Charleston Hartfield was among those killed when a gunman opened fire on a crowd of concertgoers in Las Vegas, two of his friends said. His wife, Dr. Heather Melton, an orthopedic surgeon who was with him when shots were fired, survived, the medical center said. 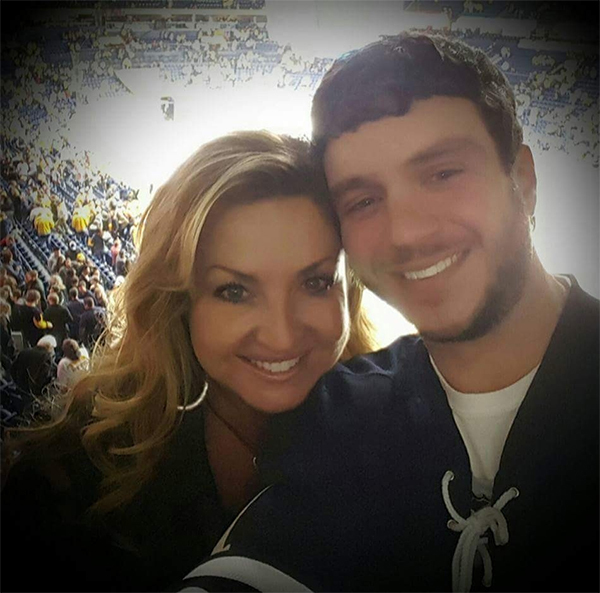 Heather Melton told WZTV in Nashville, Tennessee that her husband "saved my life and lost his." She says her husband was the most kind-hearted, loving man she ever met. Friend Jeremy Butler told the Paris (Tennessee) Post-Intelligencer that Melton was shielding Heather Melton from gunfire when he was fatally shot. Susan Smith, 53, a resident of Simi Valley, California, near Los Angeles, had worked for the local school district since 2001 as the office manager at Vista Elementary School. Finch said the school district learned about Smith's death from friends who had been with her at the music festival. She said when teachers and other staff members in the district and at the school arrived early Monday morning, most of them had not yet heard that Smith was among those who were killed. She said counselors were dispatched to the school to talk to both staff members and students and when students were told, they took part in activities such as writing letters and making cards for Smith. "It doesn't sound like much but it gives kids something to latch on to, to make sure they felt like they were able to help in some way," she said. She said Smith was married with two adult children, adding that Smith's love for country music was well-known. Karessa Royce, a 22-year-old Las Vegas local, was rushed to an ambulance by a friend after she was shot in the shoulder, said Melissa Rios, her cousin who is acting as a family spokesperson. Royce, a student at the University of Nevada, Las Vegas, is in the intensive care unit following surgery for a collapsed lung. She is expected to survive, Rios said. Royce had no identification on her at the concert, so it took the family some time to locate her, Rios said. Royce is one of five children and studying hospitality at school. Royce's friend "definitely saved her life," Rios said. Royce cannot speak, but her friend shared what happened with the family and has been in the hospital by Royce's side since, Rios said. While the sun was still shining Sunday at the Route 91 Harvest Festival in Las Vegas, Denise Burditus posted a photo on Facebook of herself and her husband standing in front of the stage, smiling broadly. The Martinsburg, West Virginia, woman was among dozens of people killed when a gunman opened fire from a hotel overlooking the festival. MetroNews, a West Virginia-based radio network, reported that Tony Burditus wrote on his Facebook page that his wife was among the victims. Real estate agent and father of three older children Rob McIntosh, 52, of North Pole, Alaska, was near the front of the stage with friends when the shooting began, according to friend and real estate broker Mike Vansickle. He was hit repeatedly but survived, Vansickle said. "From just getting off the phone with the family he took three bullets to his body," said Vansickle. "He just came out of surgery, and he's going to make it." In a personal note on his real estate website, McIntosh describes himself as enjoying the outdoors in Alaska, where he also operates a business called Santa's Fireworks. "Whether I'm fishing, snow machining, hunting, steel welding or building my own home or cabin; I stay active all year round," McIntosh wrote. Vansickle described McIntosh as being strong. "He's been though lots of adversity," said Vansickle. "He'll get through all this and come out with some stories to tell." Angela Gomez, who graduated Riverside Polytechnic high school in California in 2015, and Lisa Romero, of New Mexico, who worked at Miyamuri High School in Gallup, were also among the dead. Romero, a high school secretary from Gallup, New Mexico, was killed during Sunday night's attack in Las Vegas, the Gallup-McKinley County Schools announced Monday. District officials confirmed to reporters on Monday that Romero, 48, died sometime after a 64-year-old man fired multiple weapons. "Last night during the mass shooting in Las Vegas we lost one of our staff members," Mike Hyatt, interim superintendent for Gallup-McKinley County Public Schools, wrote to employees. "Lisa Romero, discipline secretary at Miyamura (High School), was a victim in the shooting. Our prayers go out to her family during this tragic time." She was an "incredible loving and sincere friend, mentor and advocate for students," Hyatt said. Survivors included Romero-Muniz's husband, children and grandchildren, Hyatt said. Officials announced a candlelight vigil in honor of Romero-Muniz set for Monday night. Commercial fisherman Adrian Murfitt, 35, of Anchorage, Alaska, was also among the slain, a family member said Monday. His sister, Shannon Gothard, said the family heard from one of Murfitt's friends who was with him when he died though they haven't received official confirmation about his death. Asked if the family was holding out hope that he made it after all, she said, "No. No." Gothard described her brother as a man with a big hearty laugh, a former competitive hockey player who still dabbled in the game. A four-year veteran of the Ontario, California police department was shot in the head during Sunday's shooting, Ontario Police Sgt. Jeff Higbee said. Officer Michael Gracia was injured, as was his girlfriend. "He's always real personable, upbeat, a real friendly guy," Higbee said. Parker was among four department employees who were attending the Route 91 Harvest Festival while off-duty. Another suffered minor injuries. "She was employed with the Manhattan Beach Police Department for 10 years and will be greatly missed," the department said in a statement. Nick Robone, an assistant hockey coach at the University of Nevada, Las Vegas, was shot in the chest, the school said. The Rebels men's ice hockey team said in a statement Monday that Robone had surgery to remove a bullet from his chest. The team says the bullet missed Robone's lung, and he is expected to fully recover. The team says he will be hospitalized "for the near future." At least two Canadians are among the dead. Mechanic's apprentice Jordan McIldoon, 23, of Maple Ridge, British Columbia was among those slain. The couple says their son was attending the music festival with his girlfriend. British Columbia Premier John Horgan offered condolences and says flags will be dropped to half-mast on the province's Parliament buildings and on government buildings in Maple Ridge. Alberta Premier Rachel Notley said Tuesday Jessica Klymchuk, a 28-year-old Albertan, also was among those who died. Notley expressed sympathy for the loss. Klymchuk worked as an educational assistant, librarian and bus driver at St. Stephen's School in Valleyview. In a statement, Prime Minister Justin Trudeau denounced the "senseless and cowardly act of violence." "This is unbelievably tragic and sad," Mike Matthews, superintendent of the Manhattan Beach School District, wrote in a Monday morning letter to the district. "This loss is impacting many of our staff members deeply." Casey, 35, is an alumna of the College of St. Joseph in Rutland, Vermont, and Assumption College in Worcester, Massachusetts, said Linda O'Leary, a cousin of Casey's mother who is acting as a family spokeswoman. Casey was at the Las Vegas concert with her fiancé and a friend, who were not injured, O'Leary said. Most of Casey's extended family lives in Vermont, she said. "They're receiving a lot of support and love, the best you can do with an unbelievable tragedy," she said. The family is discussing setting up a scholarship in Casey's name. Kristin Babik, a law student at the University of Florida in Las Vegas for an internship at the Clark County district attorney's office, suffered broken ribs and a collapsed lung in the shooting, the school said. "Kristin is on bed rest for now," an email from the law school's dean said. "We look forward to welcoming her back to Gainesville as soon as she recovers." Among the injured were two off-duty personnel from the Los Angeles Sheriff's Department, the agency confirmed. Both were transported to a local hospital after being hit by gunfire. One remains in critical condition and the other is in stable condition, the department said in a statement. No names or details on their positions at the department were being released at this time. Hannah Ahlers, 35, of Murrieta, Calif., was a mother of three who was shot in the head, according to witnesses. An Instagram photo was taken as they were driving to the concert. Chris Roybal, 28, lived in Southern Calif., and was an Afghanistan War vet from the Navy. He was shot in the chest, according to witnesses. He was also the former brother-in-law of Windy City LIVE! co-host Ryan Chiaverini. "He never called me my name, he always called me brother," Chiavernini recalled. Sadly, tragedy touched Chiaverini twice; his friend Hannah Ahlers, a mother of three, was killed by a gunshot wound to the head. "Why do we keep seeing this over and over again? I'm hurt right now and I'm incredibly angry. I mean, I was in college when columbine happened and I went to school in Boulder, it was right up the road," he said. And a woman named Dana Gardner, age and hometown unknown, was also among the dead. Danae Gibbs has always been a huge fan of country music concerts, said her friend, Jennifer Draper of Cedar Park, Texas, and she was thrilled to be at the concert. Draper wrote in an email to The Associated Press that Gibbs, 23, who recently graduated from Texas Tech University of Lubbock, was shot at the concert in Las Vegas and is recovering. Draper started a GoFundMe page to help Gibbs and her family with the medical expenses. On the page is a photo of Gibbs wearing a graduation cap and red Converse sneakers, jumping in the air with a huge smile in front of her university. "Danae is a strong young woman and I firmly believe she will make it through this long road to recovery!" Draper wrote. "She is a woman of strong Faith and has hundreds of people praying for her! We love Danae and cannot wait to see her!" "Right when we heard those pops, we saw Jason Aldean run off the stage, and the girl in front of me grab her neck," said Chicago-area resident Mike Anderson. "Another woman next to me got shot in the arm. So she gave me her shirt so we could tie it off so she wasn't bleeding anymore." Anderson is relieved to be home Monday night, almost 24 hours after escaping the carnage. "You could smell blood from the girls bleeding in front of us," he said. Anderson, who lives in Lakeview, was near the stage as the gunfire erupted. Bullets missed him over his shoulder, but found their marks in others. During a lull in the gunfire, he made a run for it. "We are seeing bodies," he said. "I probably saw at least eight, 10 bodies just laying there." Also in the crowd was Kevin Wagner of Bucktown. "The videos that I've seen on the news don't do justice just how long and how... just, it was so many shots," he said. "I'm never going to get that sound out of my head, I know that much." Rep. Ruben Kihuen, a Democrat whose congressional district includes a portion of Las Vegas, visited a hospital were some of the victims were taken and said: "Literally, every single bed was being used, every single hallway was being used. Every single person there was trying to save a life." Jose Baggett, 31, of Las Vegas, said he and a friend were in the lobby of the Luxor hotel-casino - directly north of the festival - when people began to run, almost like in a stampede. He said people were crying and as he and his friend started walking away minutes later, they encountered police checkpoints where officers were carrying shotguns and assault rifles. Las Vegas law enforcement officials shared a number for people to call and check on loved ones. The number is 1-866-556-9488. On Twitter, President Donald Trump offered his condolences to the victims. Trump is still planning on traveling to hurricane-ravaged Puerto Rico on Tuesday and will be in Las Vegas on Wednesday to meet with law enforcement, first responders and the families of victims. In an address at the White House Monday morning, Trump said he was grateful for the efforts of first responders. The president called the shooting an act of "pure evil," and offered words of comfort to the victims. Sanders said that "we are monitoring the situation closely and offer our full support to state and local officials. All of those affected are in our thoughts and prayers." U.S. House Speaker Paul Ryan has issued flags at the U.S. Capitol to be flown at half-mast. There were multiple reports of other active shooters at other hotels on the Strip. Police said those were false reports. There were no other shooters and no explosives, police said. The only explosives were those used by the SWAT officers to enter the suspect's hotel room, police said. Las Vegas Mayor Carolyn Goodman tweeted a brief statement: "Pray for Las Vegas. Thank you to all our first responders out there now." Sheriff Lombardo said the city received an overwhelming amount of blood donations, and blood donation centers have closed for the day. Lombardo said they cannot take any more blood donations until Tuesday afternoon at the earliest, if not Wednesday. The American Red Cross is responding and is calling for blood donors. For more information, visit www.redcrossblood.org or call 1-800-RED-CROSS. Elgin couple Nikki and Ryan Consol arrived in Vegas Sunday night for a conference. They decided to grab a bite to eat at a nearby hotel, then made their way back to Mandalay Bay. Her husband, Ryan, decided to stay in the casino and she headed upstairs. It was 10 p.m. and all of a sudden, panic. "I kind of shut off all the lights because at that point nobody knew still where the shooter was," Consol said. She got a phone call from her husband. "He called me and told me that, to lock the doors, don't answer the door for anybody that there was a lot of police officers in the building and he didn't know what was going on, he called me back and said they were being evacuated out of the building," Consol said. The shooter was on the other side of the hotel. At that moment, Joe Hartung from Frankfort, was walking along the Vegas strip with a friend and stopped to take in the sights near the concert. "We all of a sudden heard gunshots, that's when we thought it was fireworks, more went off, it sounded like an automatic weapon, and people were just running all over the place," Hartung said. Hartung and his friend ran back to their hotel and turned on the television and reality set in. "It showed me I could be anywhere, anyone can be anywhere, and anything can happen," he said. "So it's like you gotta be alert, one minute you're enjoying yourself, the next minute you're running down the strip or you're scared for your life 'cause someone out there is shooting at people,"
ABC7 Eyewitness News Reporter John Garcia talked to his brother Monday morning. Tom Garcia was on the Strip and saw the large crowd run for their lives. "You start seeing the pandemonium, then you get caught up in it. We were on the Strip. There was no one there. Cops were yelling at us, 'Go north, go north, that's when you knew," Tom Garcia said. "I just want to get home to my son," said witness Brian Foote. Arriving in Chicago from Las Vegas Monday, Foote described the scene at the Route 91 Harvest Music Festival when moments after Jason Aldean took to the stage the first shots rained down on the crowd. "We just saw sparks from the Mandalay Bay. We ran. It was survival mode at that point," Foote said. Lee Larson had tickets to the festival, but at the last minute decided not to go. His friends still in Vegas, did. "When we got to the hotel, they were laying on the ground, filthy dirty, covered up with dirty, they had lost their shoes, had to hitchhike home," said Larson. Passengers returning from Vegas describe the chaos surrounding the city in the aftermath of the mass shooting. Hotels placed on lockdown, flights cancelled as authorities tried to get a handle on the situation. "When I left this morning there were still people coming in across the street. Muddied shirts, people without shoes. People with the blankets that paramedics had," said Roger Guth. Travelers heading to Vegas from Chicago's Midway Monday were disturbed and concerned following Sunday night's mass shooting. Travelers heading to Vegas from Chicago's Midway International Airport Monday were disturbed and concerned following Sunday night's mass shooting. "From the airport, you can see Mandalay Bay. It's kind of shocking that something could happen like that right in town at a big event like that," said Kenny Borio, who is traveling to Las Vegas. When he lands, he can expect a heightened police presence at Vegas' international airport. One passenger tweeting, "Security is amped up, as you can imagine. Pre-Check lines shut down, more agents, canines..."
"I guess, kind of a little nervous," said Thomas Rzepka. Rzepka and Doreen Brown were married in Vegas 19 years ago and are returning Monday for the first time. Like the people attending Sunday night's concert, they too plan to take advantage of the entertainment Las Vegas has to offer and see a show. "I believe and I do trust they have everything under control. You just can't stop someone when they want to do something like this. It's sad, but we are still gonna go," Brown said. Vegas' McCarran Airport tweeted Monday morning more than two dozen flights were diverted to other airports. Las Vegas-based Allegiant Airlines said they sheltered 30 people who fled the concert site onto the airfield overnight at one of the airline's facilities. They're also offering free flights to Vegas for family members of victims and also waiving change fees this week. They were able to help folks clean up, get them clothes, help them charge phones and make contact with loved ones. Even though McCarran International has promised "full operations" Monday, at least four of the major U.S. airlines are allowing passengers to waive or change their flights to Las Vegas with no fee. Those carriers include American, Delta, United and JetBlue. Southwest is the biggest carrier at LAS and they have not issued a travel advisory, but Southwest doesn't charge change fees so their passengers will be able to change their plans with no penalties. "It does make you kinda nervous. We just heard shooting in Las Vegas; that's where we are going," said Marianne Borio. All flights out of Midway to Vegas Monday were on time. But many of the visitors may experience problems once they arrive. Hotels near the shooting are either on lockdown or have heightened security, and several roads including the Strip are shut down for the police investigation. Without providing any evidence to support the claim, the Islamic State group on Monday said the gunman in the mass shooting in Las Vegas was "a soldier" from its ranks who had converted to Islam months ago. The group's Aamaq news agency released two brief statements hours after the shooting at a country music concert that killed at least 58 people and wounded more than 500. The group later released Spanish language versions of these statements. In a third statement released hours later, IS name the purported attacker as "Abu Abd el-Bar al-Amriki (the American)," saying he responded to calls by the group's top leader Abu Bakr al-Baghdadi to "target the countries of the Crusader coalition" battling the extremist group in Iraq and Syria. It added that he caused 600 casualties before he exhausted his supply of ammunition and "martyred" himself. "This was an ambush if there ever was one," said Mark Kelly, husband of former Rep. Gabrielle Giffords, who was shot in a mass shooting in Tucson, Ariz., in 2008. "This was domestic terrorism." While Kelly said he and Giffords are praying for the victims, he criticized Congress for not acting. "We send our thoughts and prayers... but they are not enough. Your thoughts and prayers aren't going to stop the next shooting," he said. "Only action and leadership will do that." Chicago area politicians are also reacting to the Las Vegas shooting. Democratic Congressman Brad Schneider released a statement saying, ""I'm horrified by the senseless shooting last night in Las Vegas. This violence sears our hearts and leaves countless families forever, tragically changed. "I extend my sincere condolences to all those who lost loved ones and send prayers for recovery to those wounded. And I'm grateful for the professionalism and bravery of law enforcement and first responders during and after this attack. "Words and prayers are not enough for Las Vegas and other victims of gun violence across our country. We must come together to tackle this epidemic. Enough is enough." Democratic Congressman Bill Foster said in a statement, "We woke up to unimaginable news this morning. We stand in solidarity with Las Vegas today. We will mourn those we lost too soon and will keep their families and friends close to our hearts. But we cannot accept these tragedies as normal. There is no reason why a fun night at a concert should turn into a death sentence. We owe it to the memory of everyone who died to make sure we do everything we can to prevent another mass shooting." Republican Congressman Adam Kinzinger released a statement saying, "This morning, we woke up to horrific news of a senseless attack in Las Vegas, with more than 50 lives taken in an act of pure evil. I send my deepest condolences to the families and loved ones of the victims. And my thoughts and prayers are with the injured and all those involved in this tragedy. "Thank you to the first responders, local law enforcement, and the medical personnel in Las Vegas - their work and heroic actions saved lives. As a nation, we mourn this horrific, senseless tragedy and we stand together against this vile act of hate."